Whether you are tagging a photo in Facebook, asking Siri for directions to an eatery, or translating French into English, much of the action happens far from your phone or laptop, in a data center. These warehouses, each holding thousands of computers, are expanding quickly, and they already consume an estimated 2 percent of the national electricity supply. Karu Sankaralingam, a University of Wisconsin–Madison associate professor of computer science, has formed a startup to advance a streamlined chip design that will run up to 10 times faster than those now inside data centers. SimpleMachines Inc. (SMI) has closed an over-subscribed round of seed funding, sending a strong sign that investors see merit in its streamlined approach, Sankaralingam says. “Existing server chips have been designed for various types of functions, but not all of these functions are necessary to run the range of data-center operations,” Sankaralingam says. By stripping out unnecessary functions, and other tactics, the chips will use less electricity, reducing the need for energy to cool vast rooms full of servers. Many of the benefits stem from a radical slowing of the chip’s “clock speed,” the potential number of calculations performed per second. Although little noticed outside the industry, there’s a growing disparity between the high-speed processors and slower memory units that feed them data. As a result, processers often must sit idle for 300 cycles or more, waiting for data. The cores in SMI’s design are only 5 to 10 percent as fast as data-center standards. Each core is only about 1 percent as big, which allows them to sit closer to the memory units that supply data. This proximity, combined with the greater number of cores, translates into better overall speed, which helps explain the paradox of a chip that is both slower and faster. The slower cores require far less power, and create less waste heat, which combine to slash electricity consumption. University’s Discovery to Product program helped to shape its marketing strategy. Sankaralingam’s fellow co-founder is Jeff Thomas, who was a vice-president at Sun Microsystems. Graduate students Vijay Thiruvengadam, Vinay Gangadhar, and Tony Nowatzki are also involved in the project. SMI has filed one such patent through WARF, and is exploring several more filings. 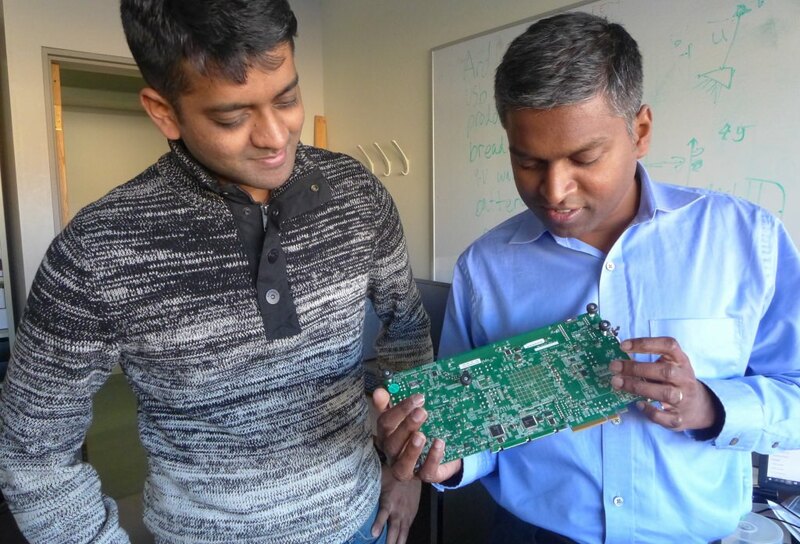 Today’s data centers run on a single type of chip, which may not be very different from what’s inside a laptop, Sankaralingam says. As data centers need to grow, competing firms are offering updated chip designs that would require data centers to use an array of different, specialized chips. In SMI’s design, “We think we have struck the right balance between supporting enough general programmability to solve more problems, while being an order of magnitude better in performance,” Sankaralingam says.